Brace yourselves for the highly anticipated video release of “Do SUMTHIN” by primetime artist Heresy featuring area legend Jay Rastik! The video, set to drop Saturday September 24th, has surprise appearances and cameos from other decorated artist and staples in the city. Don’t put anything past yourself and your potential to make your dreams come to life. Humans have defied incredible odds to showcase their creations time and time again. Far too often people get caught up in the success of celebrities and forget that they just like you started with a dream. They just like you had times of desperation, despair and lack of hope. They just like you had people, even family and friends, doubt them and downplay their dreams. However, if they can achieve success and notoriety on a massive level so can you! The message of this song rings loud and clear in a time where the city needs it most. 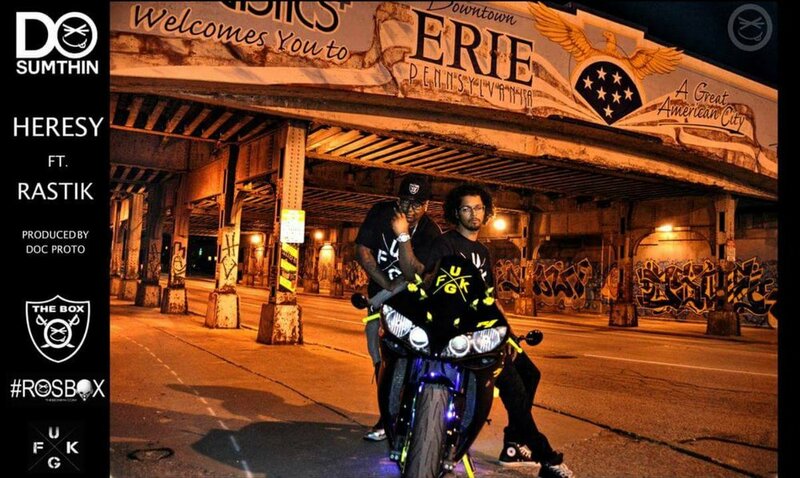 Hip Hop as a genre has started to rise into the Erie way of life like the rose that grew through concrete. Many people and establishments dismissed Hip Hop artist and culture as vicious and savage. They just failed to realize that artist use their platforms to reflect their environment. So rather than point the figure at artist who merely do their duty as a reporter would, we should embrace and accept them. We should also work together to improve the environment so that more positive content and reports emerge. At the same time artist must keep in mind to remember to use their power and influence wisely as Jay Rastik and Heresy do. Knowledge, positivity and inspiration are the new cool! Much appreciation to artist like Heresy and Jay Rastik for going against the grain and not falling into the category people want to box them into. They won’t get cornered into portraying those violent and brutal rappers that society wants them to depict. Rather they have started to make critics eat their words (as they should) by sending positive and inspiring messages of hope to their city of Erie and well beyond! Remember your situation won’t change unless you do. When you have a strong enough reason why you want to accomplish a goal, how to accomplish it will take care of itself. Just take action and let the rest fall into place. People can talk all day, especially on social media, about what steps will help but ask yourself have you taken a step to use your passions or potential to help? Let your ears serve as the open windows to your soul as you digest their powerful words. Let your eyes serve as your trusted receptors to the unique and creative visuals. And when all else fails remember, do something! Show some love and support at the free Pop Up Shop video premier this Saturday at the Box’s shop on 1029 State street. And get your hands on your own exclusive “Do SUMTHIN” merchandise so you can represent to the fullest!